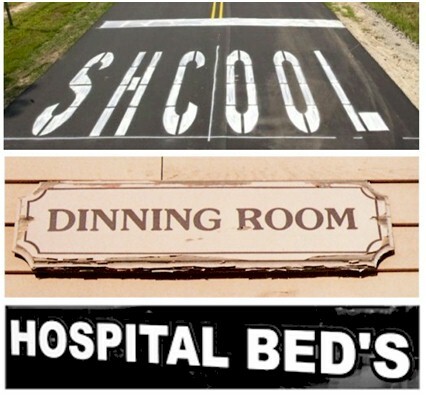 Big, expensive signs have misspelled words, typos and bad grammar. Most books have them, too. Look closely. English poet Alexander Pope (1688-1744) ) wrote “To err is human; to forgive, divine.” I'm far from divine, and I find errors more amusing than forgivable, especially if they are avoidable. Most errors I find could be avoided if people (including me) tried a little bit harder, or had someone to help. No writer should be her only editor. Even professional editors who write books should hire other editors. It’s not just a matter of errors in spelling or grammar. You may have words in your mind that you think are on the page, but are really not there. I've found that the average number of errors in a professionally-produced 300-page book from a major publisher is six. Self-published books often have a great many more. Some errors are the result of mistyping, but others are the result of misunderstanding or gaps in knowledge. According to Outskirts Press boss Brent Sampson in Self-Publishing Simplified , "Peter Mark first published the Thesaurus in 1852," strangely ignoring the much more famous Peter Roget who published his Thesaurus in the same year. Actually Mark was the middle name of Peter Mark Roget, so Sampson was two-thirds right. Brent also wrote "forward" instead of "foreword." A publisher should know better. 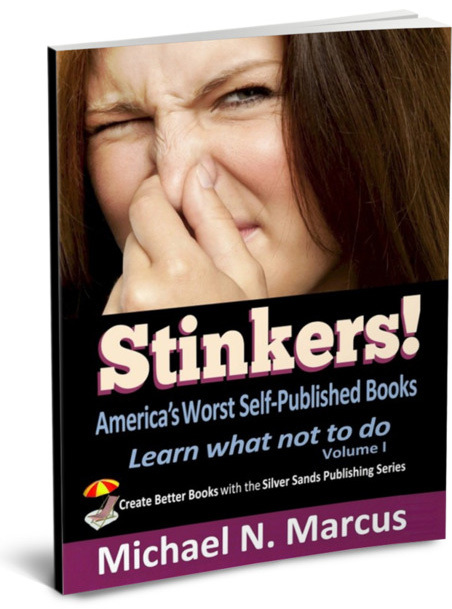 Principles of Self-Publishing: How to Pub­lish and Market A Book or Ebook On a Shoestring Budget by Theresa A. Moore is one of the most-error-ridden books I've ever read. Theresa says that Lightning Source “is a full service publisher.” Lightning is not a publisher of any kind. It is a printing house that works for publishers. It does NOT provide services such as editing and page formatting, which a self-publishing company provides. Anyone who is advising publishers should know the difference between a printer and a publisher. Theresa complains that Lightning Source charges an “exhorbitant shipping fee” for a proof. Both her spelling and her assessment are wrong. Go the F*ck to Sleep reached number-one on two Amazon bestseller lists. It was published by Akashic Books. The Dever Post said, "Akashic is one of the most impressive of the newer small presses, in part because of editing and production values that rival and perhaps surpass the big houses. . . ." One poem in the book says: "The lambs have laid down with the sheep." The correct word is LAIN -- not laid! Newsweek once spelled "Newsweek" wrong. Time spelled the name of MAD's Alfred E Neuman as "Newman." 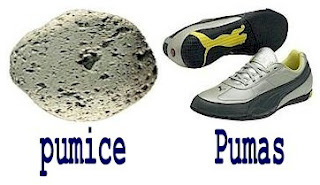 Years ago, the New York Daily News reported on a teenage fashion trend: "wearing pumice." In reality, high school kids were not wearing lumps of volcanic rock that are normally used as an abrasive to remove calluses from feet. They were wearing Pumas, a brand of sneakers. Orange County Choppers: The Tale of the Teutuls by Keith & Kent Zimmerman has silly geography errors. It's disturbing that three Teutuls plus two Zimmermans plus fact checkers and editors at Warner Books could let obvious errors get printed. On page 11, Paul Senior talks about his parents charging people to park in their driveway on Cooper Street in Yonkers, to watch horse races in Yonkers Raceway or baseball games in Yankee stadium, which were within "walking distance." While the track is just a few blocks away, the stadium is about 8.5 miles south. The 17 mile round trip is not "walking distance" for most people. I hope he calculates more precisely while building bikes. Twice on page 15, Senior mentions his house in "Muncie", New York. Muncie is in Indiana. The Teutuls lived in MONSEY (which is pronounced like Muncie). In Desperate Networks by Bill Carter, an otherwise excellent book, there is this strange sentence on page 366: "What do expect for this?" What the heck does that mean? There's also sloppy editing a little earlier on page 359, where it says "...Les could get eventually get control of the studio." I'm only an amateur, but I found these flubs. Where are the pros who get paid to find and fix them? Since I am human, I, too, make silly mistakes (but never stupid mistakes). Errors can hide anywhere, not just in huge signs like up above, but even in parts of a book where nobody looks. I once left out a letter in the name of my city in the logo on the back of a book. I fixed it. Just minutes before I had planned to send another book to the printer, I decided to check my table of contents. I had a feeling that, as I changed the length of some chapters, a page number might have changed. I actually found three wrong pages, and two chapters were missing from the table of contents. I made the necessary repairs, and the book was delayed a week. In one of my books, a chapter that is in the book is not listed in the table of contents. I know from sad experience that the act of fixing one error can cause others, so I decided to live with it -- the only time I knowingly let an error be published. In Greek-Roman mythology Arachne was a skilled human weaver who bragged that she was a better weaver than Minerva. Minerva was the Roman equivalent of the Greek Athena and was goddess of weaving (and of other things, and the inventor of music). Arachne refused to acknowledge that her skill came from Minerva. According to Ovid, the goddess was so envious of the magnificent woman-made tapestry, that she destroyed the tapestry and loom, slashed Arachne's face and turned Arachne into a spider. In biology, "Arachnids" are the group of critters that include spiders. Makers of Persian carpets make obvious errors in their rugs to show that no one is perfect except Allah. Some people believe that the gods might be angry about arrogance of a human effort to produce a work of art without imperfection. Navajos thought evil spirits could escape only through an error in art. There are dozens of chapters which are listed in the book, and so far no reader has complained about the missing one. I hope Allah and Minerva approve. Well, i believe if you have misspell words or have grammatical errors in your content whether it is published online or other though other media it have some bad effect on your branding. No worse than your terrible English.